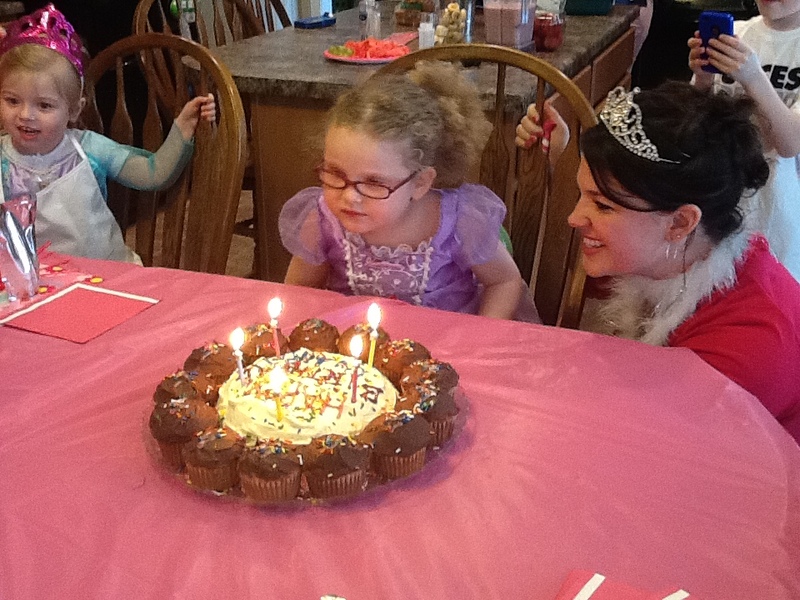 Happy 4th Birthday, “Princess” Claire! Today we are celebrating another milestone for Claire… she turned 4 years old! Wow… happy, happy, happy birthday, Peanut!! After the girls said their hellos, the princesses then all gathered around our kitchen table, and began decorating their aprons and placemats. After they were finished, they began making their lunches, which consisted of fruit kabobs aka: their magic wands (they used cookie cutters for fun hearts and stars shapes) to go along with a sweet fruit dip. They made princess crown sandwiches and strawberry smoothies. They dipped the rims of their cups in pink sprinkles and enjoyed their drinks with fun straws. Claire led the crew by showing them how she can use a big button switch to activate the mixer, blender, and our newest toy, the automatic pourer. This was a big hit. After the girls were done making their food, they ate it, we sang to Claire and then enjoyed some cupcakes and ice cream sundaes. This was Claire’s first official “friend” party and it was so darn cute seeing these little girls all dressed up, having fun. Claire’s been feeling better, thank goodness! After going through recent tests, we know that Claire is not aspirating when she is eating. (yea!) Her reflux has gotten worse than before, so the doctor put her on a different medication that we are trying. We will know over the next month or so if the medicine is helping. If it isn’t, we’ll most likely look into if she has food allergies or other possible reasons for the GERD. Her choking at times throughout the day has to do with her having an uncoordinated swallow. At this point, the doctor said there isn’t much we can do about this. This part stinks… I wish I could do something to help her when she starts coughing, choking, followed by her face turning bright red. I can only imagine how uncomfortable this must be for her. I have to say… when she does this, especially in public, it makes for a great conversation starter. It’s happened a few times where strangers will come up to us and ask us if they can do anything to help. The other quick update I had for you is regarding Claire’s school. After a few meetings this past month, etc. her IEP for the next school year has been signed last week and it is now in place. I feel the discussions we had with the school addressing communication concerns among other areas were beneficial and helpful. We worked together to ultimately come up with a new overall plan. I’m feeling good with the outcome… so, here’s to a great (fingers crossed) upcoming school year for Claire. The following video/ pictures were taken yesterday from her private therapies. With her OT (occupational therapist), she’s working on trying to feed herself again. It’s been a little over a year where she was able to pick up a cheerio. Within the same OT session, they are using construction paper to make a birthday cake. Finally, in PT (physical therapy), Claire was trying out an adaptive bike. Hopefully this bike will be covered by insurance because it is pretty darn cool! I can see Claire riding outside with her brothers on this bike for years to come. She loved riding this, especially when she was going fast. So, happy birthday to my sweet little sparkplug… whose smile literally lights up the room wherever she goes. We love you so much, Claire! How sweet!!! So cute to see them all dressed up and having such fun. Happy, happy Birthday to Claire. omg this is way too cute — all those princesses at the party looked adorable! thanks for posting, I always look forward to what’s up with Claire. Love, love, love this!!! Absolutely adorable! Happy Birthday, Claire! Thanks Coll for this latest report. You haven’t lost your touch in planning fun or important events. Loved the photos too! Her smile and yours says it all. And if Claire is a “princess”, you certainly are a “queen”!! !